Rewatching X-Men recently, I was struck by just how good a film it is. The plotting is tight, the large cast is all handled well, and the few changes made were all for the better. In fact, there was only one bad moment in the whole film (what happens to Halle Berry when she's given bad dialogue? The same thing that happens to everyone else). Thus, I was really looking forward to the sequel. The first time around, X-Men got some decent toys. Though the sculpts were a bit sub-par, ToyBiz pushed the envelope on action features and playability. Most of the toys did something cool, and none of them had unsightly levers sticking out of their backs. The packaging design won a ToY Award, and we got at least one figure of every character. That's more than most properties can claim. 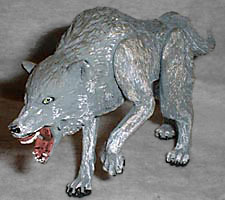 Of course, toys have come a long way since summer of 2000; back then, "super poseable" meant 12 points of articulation. Spider-Man Classics and Spawn Series 19 had not yet shown fans how good the combo of sculpt and articulation could be. Now X-Men 2 has its own figures, and they're a step up from the originals. We got a "civilian" Wolverine with the first movie, wearing a real denim jacket. It wasn't bad, but the jacket was oversized (a common problem with real cloth on toys) to the point of looking ridiculous. 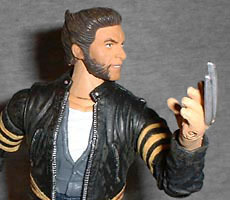 This time Logan is wearing his leather jacket and while it's a separate piece, it's still molded plastic, so it looks much better. You can also see how this jacket influenced the current X-Men costumes. Logan's sculpt is very good, with all the wrinkles and fading that real clothes would have. Even his zipper and the Indian Chief belt buckle are reproduced. His facial sculpt looks more like Hugh Jackman than any Wolverine yet, though you'll have to check the paint job in the store: that little half growl of his is applied rather haphazardly in some cases, and his furry sideburns can get a bit sloppy. It's not hard to find a good looking Logan, but it does require a few seconds' examination. Logan has "Tornado Claw-Slashing Action," which is actually a really nice feature: twist him at the waist and he swings his arms. Not exactly the most groundbreaking action feature of the year, but ToyBiz has given it a new twist (no pun intended): through clever use of gears, Logan's neck moves as well as his arms; he always keeps looking ahead at his opponent as he attacks, and that's pretty darn cool. All that engineering doesn't get in the way of Logan's articulation though. Currently no toy company is giving us super articulation as consistantly as ToyBiz. Wolverine moves at the ankles, shins, knees, thighs, hips, waist, shoulders, elbows, wrists, neck and hands. His claws (and the backs of his hands) are a separate piece glued into place. Like all Wolverines, his claws are prone to bending. He comes with one accessory, a wolf that moves at the hips and jaw. A lot of folks have said that Wolverine's claws are too short, but they just need an anatomy lesson: your arm, from elbow to wrist, is the same length as your foot; Wolverine's claws reside entirely within his forearms when they're not out, since he can still flex his wrists and elbows when they're retracted; considering the mechanisms necessary to move the claws in and out, the blades would have to be just a bit shorter than his feet in order to work. 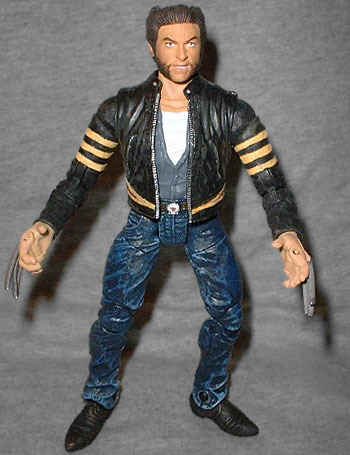 At 6⅛" tall, Battle Attack Logan fits in with the Marvel Legends in size as well as sculpt and articulation. The X-Men toys have come quite a way in the three years they've been away, and Logan is a good example of this.